, a celebrated French physician, was born at Merey, near Mont fort- Lamaury, a small town of the isle of France, in the year 1694. 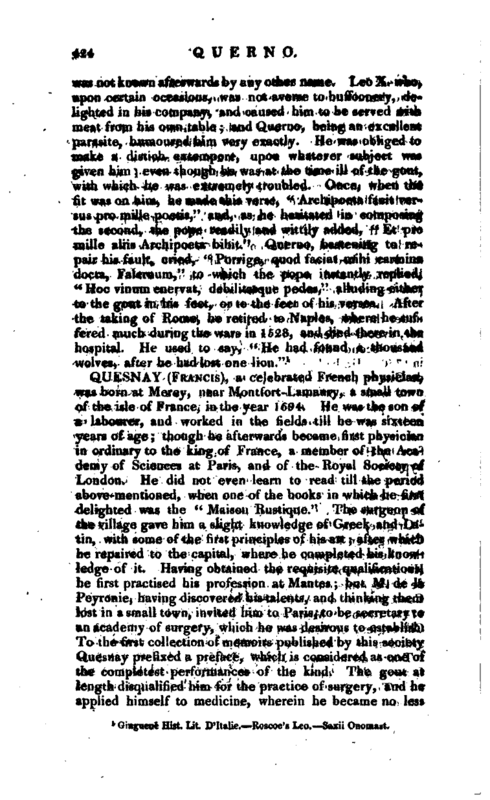 He was the son of a labourer, and worked in the fields till he was sixteen years of age; though he afterwards became first physician in ordinary to the king of France, a member of the Academy of Sciences at Paris, and of the Royal Society of London. He did not even learn to read till the period above-mentioned, when one of the books in which he first delighted was the “Maison Rustique.” The surgeon of the village gave him a slight knowledge of Greek and Latin, with some of the first principles of his art after which he repaired to the capital, where he completed his knowledge of it. 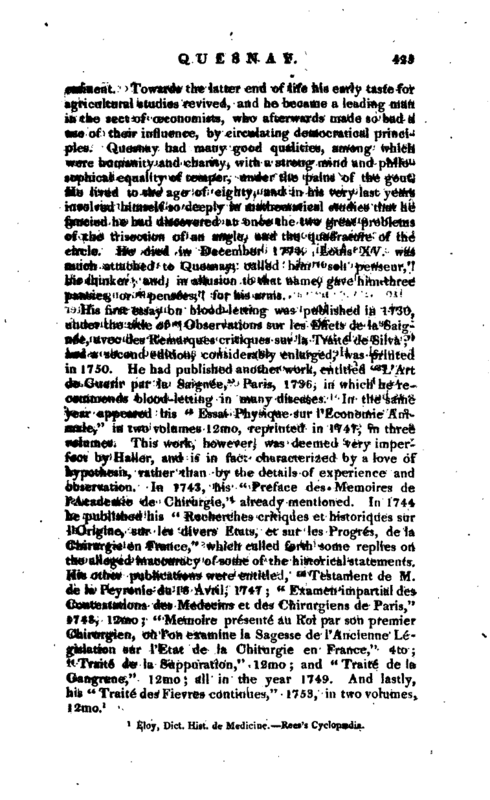 Having obtained the requisite qualifications, he first practised his profession at Mantes but M. de la Peyronie, having discovered his talents, and thinking them lost in a small town, invited him to Paris, to be secretary to an academy of surgery, which he was desirous to establish. 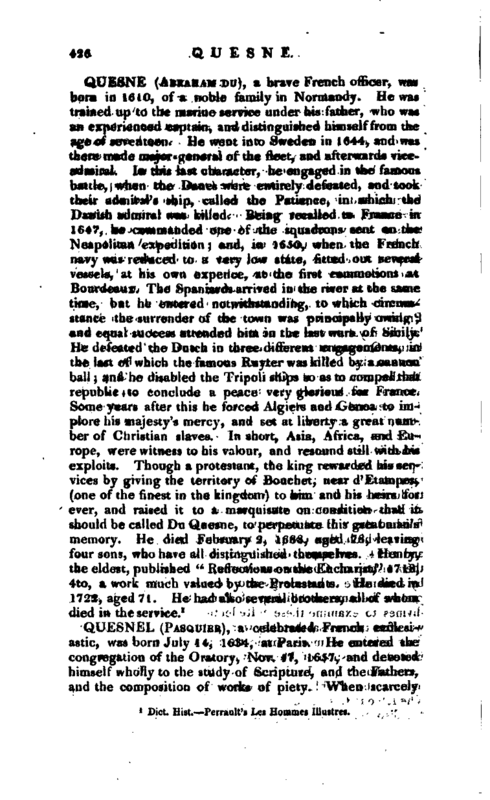 To the first collection of memoirs published by this society Quesnay prefixed a preface, which is considered as one of the compietest performances of the kind. The gout at length disqualified him for the practice of surgery, and he applied himself to medicine, wherein he became no less | eminent. Towards the latter end of life his early taste for agricultural studies revived, and he became a leading man in the sect of ceconomists, who afterwards made so bad a use of their influence, by circulating democratical principles. Quesnay had many good qualities, among which were humanity and charity, with a strong mind and philosophical equality of temper, under the pains of the gout. He lived to the age of eighty, and in his very last years involved himself so deeply in mathematical studies that he fancied he had discovered at once the two great problems, of the trisection of an angle, and the quadrature of the circle. He died in December 1774. Louis XV“. was much attached to Quesnay, called him” son penseur,“his thinker; and, in allusion to that name, gave him three pansies, or” pensees," for his arms. Eloy, —Dict. Hist. de Medicine. Rees’s Cyclopædia.